​Hello - just wanted to update everyone with time frames for opening weekend. Note that after the Wednesday (the 24th) practices, Lunt field will be closed for practice in order to get ready for the weekend. There is a rookie practice scheduled for Thursday. That will be the only one allowed. Uniforms will be handed out Friday starting at 5pm at the field house. You must have your registration paid and your raffle ticket money paid in order to receive your players uniform. Please bring with you if you have not handed them in yet. If you can not make it Friday, you can pick up the uniform on Saturday at pictures. The location of this event MAY change. The weather does not look good and we may change to an indoor venue. This announcement will be made Friday via the web page and Facebook. If there is no posting, there is no change of venue. Pictures will be on Saturday at the field house. Times for each team are posted on the website and on the Facebook page. The only change is that I am going to have Smitty's squeeze in at the beginning because they have picked up a game with a Frontier team and need to get there in time. But we'll try to get them done prior to 11:00 so it doesn't effect the timing. Bring your yellow picture envelope and give it to the photographer at the time of the pictures. You do not turn this in to a coach. Opening Day Parade on Sunday. Finally, all players should meet at the Greenfield Middle School parking lot at 9:30 am Sunday for the opening day parade which will start at 10:00am. Everything is starting to come together. Our biggest adversary right now is mother nature.....but we can only deal with what we can control. See you this weekend!! ​The following is the schedule for picture day, Saturday April 27th at the GMLB Field House. Your player should receive a yellow envelope from their coach at practice. The envelope has the different package options. Bring this envelope with payment and give to the photographer on the day of the shoot. If you would like to manage or coach a tournament team this summer you must sign up on the sheet located in the Lunt Field Club House by Friday April 19th. If you have questions, please speak to a GMLB Board Member. Big Thank You to Dillon Chevrolet!! 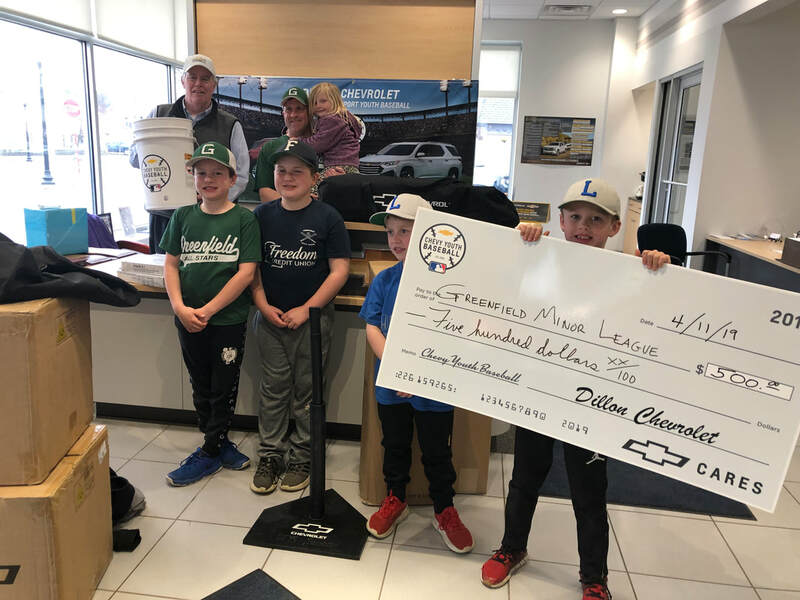 Many thanks to Dillon Chevrolet for donating money to purchase much needed equipment for our league! Coach Williams will focus on: structuring practices to maximize repetitions so kids improve and perform consistently, keeping it fun, and keeping kids accountable. Coach Branson will focus on evaluation and improvement of individual hitting, pitching, and fielding - finding strengths but also how to help kids improve technique and attitude. Get this on your calendar. 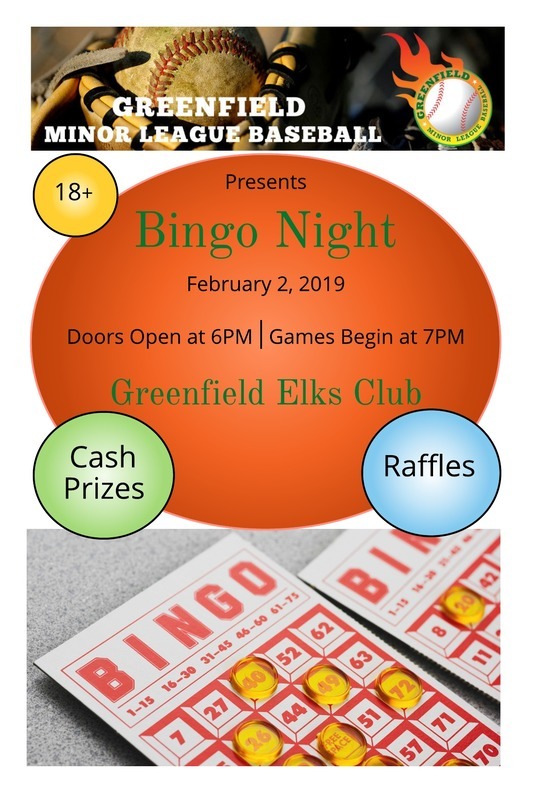 You will not want to miss - a great time and great prizes, all to support Greenfield Minor League Baseball! The elections for the 2019 Board of Directors is upon us. In order to be considered to be on the board you MUST attend the meeting on Thursday September 20th. It will take place at the Greenfield Elks Lodge at 8:00pm. We have lost several people from the 2018 board and are looking for people dedicated to the longevity of Greenfield Minor League Baseball. Hope to see you there.